The stage is set for Super Bowl 51 in Houston. 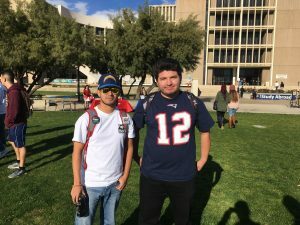 Many students will be watching the Atlanta Falcons face off against the New England Patriots in what will be a battle between two of the best quarterbacks in the National Football League (NFL). Quarterback Matt Ryan and the Falcons beat the Green Bay Packers 44-21 in what was an impressive showing for this Atlanta team on Jan. 22. The Falcons have shown all year that they have one of the most potent offenses, but in this game, the defense stood out by shutting down the red-hot Green Bay Packers quarterback Aaron Rodgers. The Patriots and their star quarterback Tom Brady took down the Pittsburgh Steelers 36-17 on Jan. 22, proving why this team has been one of the best teams not only in this year, but in the last decade. This is new territory for the Falcons, as it is just the second time Atlanta has been in the Super Bowl in the franchise’s 51 year history. If they can win this game, it will be their first Super Bowl victory. As for the Patriots, it is their ninth Super Bowl trip in franchise history. They already have four Super Bowl championships and they are now looking to get their fifth. With the Patriots track record of recent success, it is hard to bet against them, which is why they are the favored team to win the Super Bowl this year. Student Charlie Bartley believes the Patriots will beat the Falcons in the Super Bowl. “With Tom Brady at quarterback it is hard to bet against the Patriots because he has been so good in his career,” said Bartley. Falcons fans have been waiting for another chance to watch their team play in the Super Bowl since their last trip in 1999. Student Steven Best has been a Falcon’s fan since he was a little kid, so he is enthusiastic to watch his favorite team try to win this year’s game. “I am very excited to see my team play in the Super Bowl. It is something that a lot of people don’t get to experience in their lifetime,” said Best. The Super Bowl is not just for the fans of the two teams in the game; all football fans can look forward to watching it. For football fan Micheal Castonguay, he looks forward to the Super Bowl every year regardless if his favorite team, the 49ers, are playing in it or not. “The Super Bowl is one of my favorite times of the year,” said Castonguay. “Not only do you get to watch a great football game, but it brings together friends and family to hang out together and watch the game with great food,” continued Castonguay. With last year’s Super Bowl having the third largest viewing audience in television history, this game will likely have similar results. A few fans have a take on who they believe will win the game. Buffalo Bills fan Tyler Thomas is not very fond of the Patriots and believes the Falcons will win. “I am tired of watching the Patriots win all the time and I think this year they will lose to the Falcons which makes me happy,” said Thomas who is getting ready to throw his very own Super Bowl party this year. Super Bowl 51 will take place at NRG Stadium in Houston on Feb. 5.